Gone are the days when the kitchen was designed for one person to prepare food, cook, and clean up, all in an enclosed space removed from the rest of the house. Dining, socializing, and other family activities took place in separate rooms tailored to those functions. Kitchen design used to accommodate one person performing these key functions with a “work triangle” layout that allowed easy access to the sink, range, and refrigerator. Today’s kitchens are typically the busiest room in the house and must perform multiple functions and accommodate numerous people at once. This is why open plan designs are so popular as it allows an easy flow between the kitchen, dining, and living areas that is more conducive to the modern household. So, before you start searching the internet for the perfect kitchen cabinets, backsplash tile, or light fixtures, take a step back and look at the big picture by considering the kitchen layout that will make your home operate seamlessly. How much space do you have and what shape is your room? Are you willing to make structural changes to the room like knocking down walls? How frequently do you cook and how many people cook at once? What other activities does your kitchen need to accommodate, such as kids studying, working from home, or pets? Design requirements are specific to the needs of the individual household and a kitchen remodeling project is the perfect time to create a layout that will make sure all your needs are met in one smoothly functioning space. How can a single layout meet the diverse requirements of the modern kitchen in one room? Create distinct work zones for each key function, and position them so that the different zones create an easy flow of traffic through the kitchen. Core work zones may include food storage, preparation, cooking, clean up, dining and entertaining. Although a larger kitchen gives you more space to work with, any size or shape kitchen can be well-organized by carefully considering how to arrange these zones. If you have space in your home and budget, consider making structural changes that will make your kitchen a more livable and enjoyable space. Take the opportunity of a full kitchen renovation to knock down a wall as was done in the design below or move around your appliances or cabinets to allow a more sensible workflow. If you tend to have more than one person cooking or do a lot of high volume entertaining you may want to add a second food preparation area to give both cooks plenty of space to create their culinary delights. 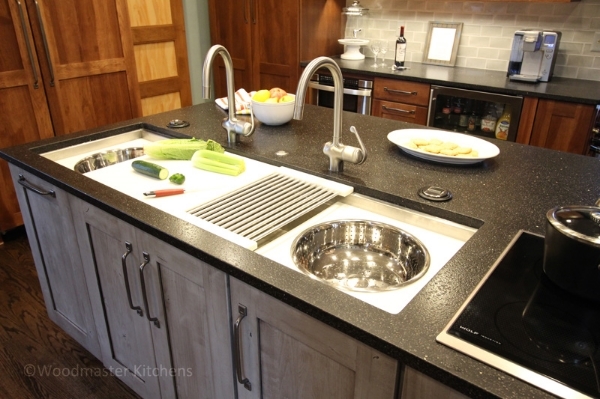 The kitchen design pictured below included a large Galley Sink with double faucets to ensure two cooks could work side-by-side. Entertainment zones should be accessible to the rest of the kitchen but distinctly separate from the cooking area. Guests should never be tripping over the cook in order to find their way to an appetizer or drink. The kitchen pictured below solved this problem by installing two islands, allowing plenty of space for guests while having a distinct cooking area. If you entertain frequently or have a busy household with kids, you may want to install a beverage bar or refrigerator like the one below, or possibly even a snack station away from the main cooking zone. This allows children and guests to help themselves to drinks and snacks without interfering with the cooking. Use your kitchen island or other structural features to provide a clear distinction between your main zones. The island is the perfect feature to divide your room, providing space for food preparation and cooking on one side and seating for dining and socializing on the other side, like the island pictured to the right that incorporates The Galley Sink. The layout is the foundation of your kitchen design. Work with your design professional to find the ideal layout for your new kitchen and experience the difference a smooth workflow can make in your life!